When touring the Finale Editworks 9,500 square-foot facility near downtown Vancouver, technophiles thrill to the sight of room after room packed with hi-tech gadgets, screens, computers, control panels and thingamajigs galore laid out in a comfortable, elegant setting. More impressive, however is running into a Los Angeles producer who, unbidden, stops to gush about the Finale editors. ‘Says they’re the best. That, when she can’t work in Vancouver, she flies her Finale editors down to L.A. ‘Won’t work with anyone else. High praise. And well-earned. Since founding Finale in 1988, Don Thompson (formerly of CTV, U.TV and The Eyes), and his partner Dale Johannesen, have laboured to make Finale the best at what it does. Which is providing complete post-production services, including off-line editorial, on-line editing, and special effects design and duplication for television commercials, broadcast programs and videos. At Finale, the editing process begins, obviously, when the client brings in what has been shot. The editors do a rough off-line edit, the client approves it, then they move to the high-resolution on-line edit, where colour corrections are made and sound and special effects are added. During the off-line phase, clients may have their own editors and creative staff involved—this is the decision-making process, where the piece is built from its original elements. But, once the project moves to the high-tech, creative on-line phase, the Finale editors take over. And it is this process that sets Finale apart. That doesn’t mean that clients can’t be involved at the on-line stage. “The creative process often depends on the synergy between our editors and clients, so producers can work from our office and supervise at all stages of the production. 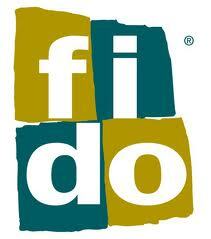 That’s a real comfort to those clients who have a specific direction and want to remain very much involved. Other clients, though, let the editors work their craft, and only come in to oversee the finishing touches. The majority of Finale’s clients are independent documentary makers, video producers and advertising agencies; about 70% from Western Canada, the rest from Toronto and Los Angeles. Most business comes through word of mouth, but the company has benefited from an inventive advertising campaign (care of the erstwhile Moreland & Associates) and more effort has been put into marketing. 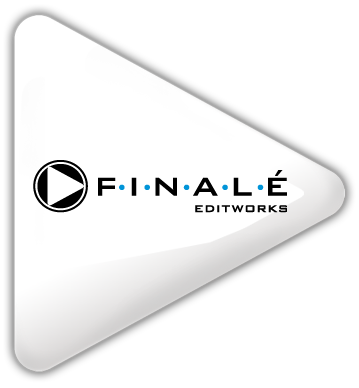 Sound editing has lately become an increasingly important part of Finale’s services, largely due to client demand, and it recently installed a new audio studio. And Finale’s sister company, Image Engine Design & FX, has evolved from an in-house graphics department into a successful stand-alone boutique. (Finale also owns Shooters Production Services.) Thompson says that the clients now know that Finale can handle all their needs. 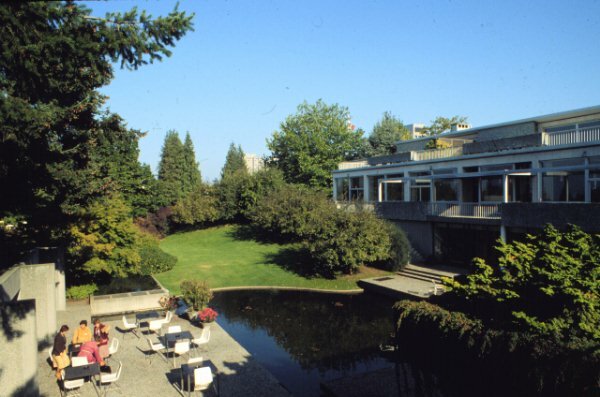 Among its many blessings and advantages, Vancouver has two national treasures who have steadily worked to define the first standard of Canadian landscape architecture. 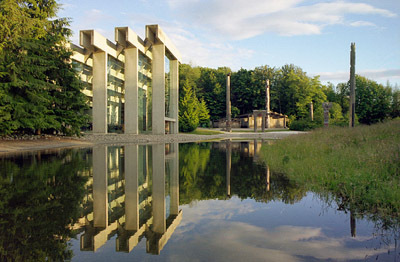 The first is Arthur Erickson, now one of Canada’s most famous architects. While not a landscaper, per se, the Vancouver native knows more about it than most. When he was growing up in Vancouver, no one in his family had much of an interest in gardening but, from boyhood, roses were a hobby and he held a deep interest in botany and biology. Erickson headed to McGill University then, after graduating in 1950, he spent three years in Europe, observing its buildings and landscaping. In 1953, he returned to Vancouver but found that his unorthodox approach didn’t fit with that of his conservative colleagues, so he took a teaching job at the University of Oregon. In 1957, UBC offered him a position, and he spent the next seven years teaching and working on residential projects. 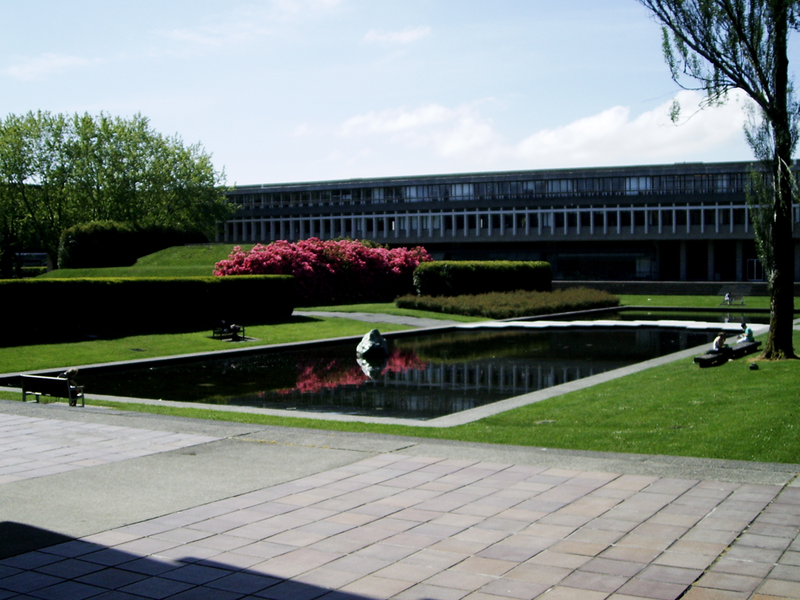 In 1963, Erickson won the competition to design Simon Fraser University (SFU). Unable to teach and build, he gave up teaching and never looked back. 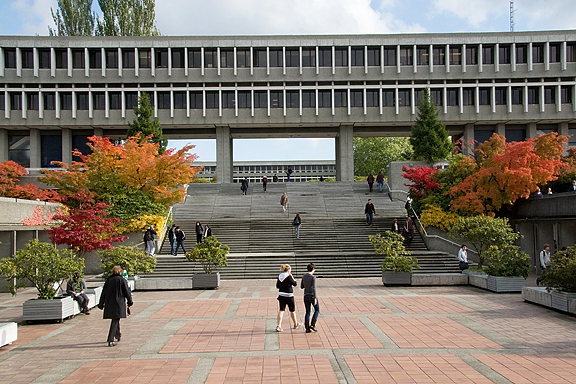 SFU covers 900 acres, but Erickson only landscaped the central quadrangle, leaving the rest for playing fields and meadow. Much thought, however, was put into the landscaping of that quadrangle. From the entry of this garden, or the top of the stairs, you see a long, formal pool featuring an enormous block of Fraser River jade. Three long stepped-up hedges of Rhododendron and Pyrus partially hide a pyramid structure in which people can sit and study, and Locust trees enclose a small playground. Silver Maples provide shade, and there are Dogwood and Hawthorn trees—loose forms contrasted with thin forms. 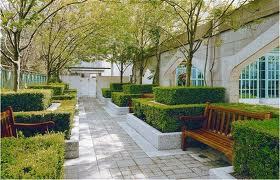 The overall design, and the use of hedges, gives the illusion of greater distance. 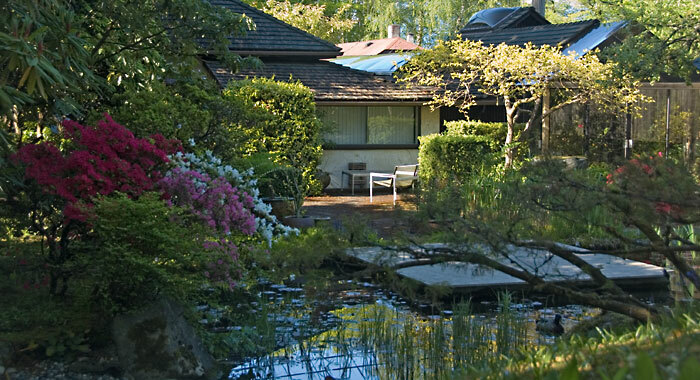 The garden at Erickson’s own home has become famous due to admirers’ efforts to have it declared a Heritage Site. It reflects his opinion of how a private garden should be. “I like natural, underground gardens. Over-designed landscapes feel contrived. I want everything flowing together and messed up. “When I bought my house, the garden was all grass. By the third year, it was weeds with a few struggling flowers. So I bulldozed the lawn into one great mound. I made a pond, which I’ve never cleaned, and I planted Pine trees and grasses taken from beside the Fraser River. For colour, I use pots of flowers. The rest grows wild. Erickson also believes that one of the most important things for any landscape is for all elements to belong. His preoccupation with a connection between the nature of a site, and what is planted in it, or built on it, comes from growing up in BC. “When you live here, you spend much time experiencing nature. The landscape becomes an influence. That explains Wright’s influence on me as an architect. His buildings interpreted landscape experiences—the edge of a cliff overlooking a valley, or a forest at the top of a mountain. I’ve always been excited by the design adventure offered by the physicality of a site. 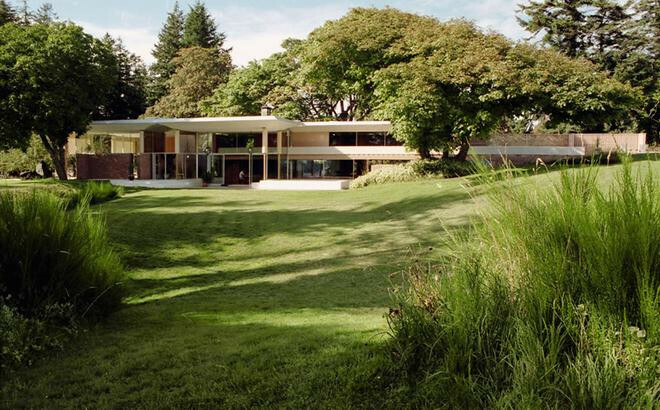 This approach appeals to those who wish to build homes on difficult sites and there are several prominent Erickson houses and gardens in the Vancouver area. “I recall one site that was a former dump; there was a stream beside it. Rather than landscape the dump and put the house beside it, I put the house on the dump and tapped the stream to make a lake. 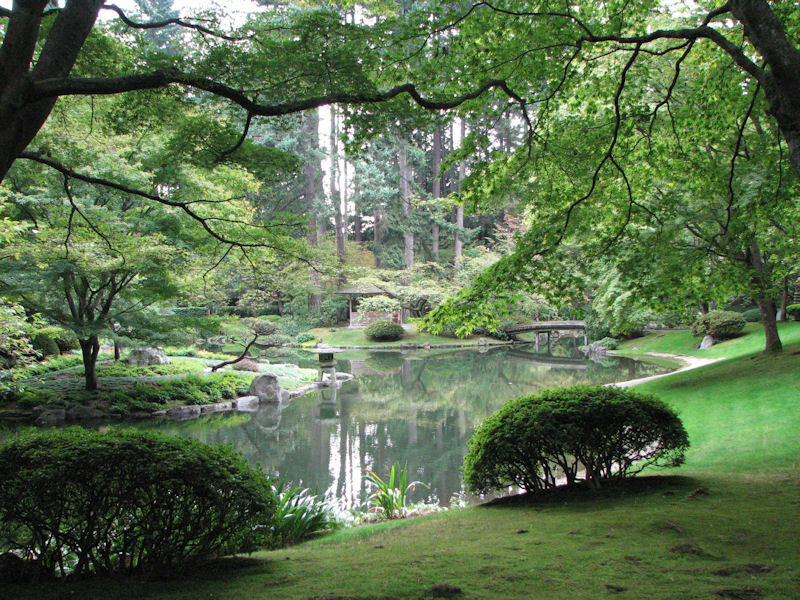 In another case, the garden was seen through a low window, like in a Japanese teahouse. I concentrated on the ground plane, added dry rock and rearranged the existing plant material to allow the garden to be viewed properly. For commercial projects, Erickson prefers an orderly landscape with touches of wildness. 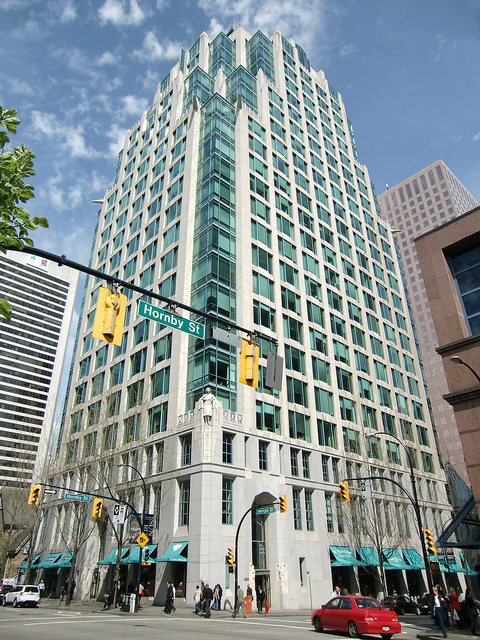 One of Erickson’s most difficult sites was one of his most recent, and famous, projects—the new Canadian chancery in Washington. My instructions from the Canadian government were to express neighbourliness, openness and friendship,” recalls Erickson. “But Washington’s regulations are severe—there are 20 committees overseeing style, shape, height. I had to use those restrictions in my design. 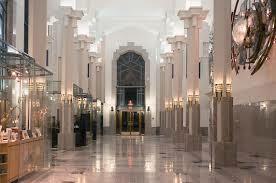 “I studied the street and the site, which is on Pennsylvania Avenue, opposite the US National Gallery and its new I.M. Pei wing. I was captivated by the neo-Classicism of Washington’s buildings and the consistency with which that style appears in the lines and heights of these buildings. So I chose the idiom of the southern plantation house with the grand columns and large front porch. But I put the porch inside the building and kept to the Classical order of base, body and top. Then, to echo a nearby building, I made a rotunda as a means of support. The overall effect is one great sweep which, I feel, is the character of the Canadian landscape—one enormous expanse and sense of space. Erickson never deals directly with nurseries or gardeners. 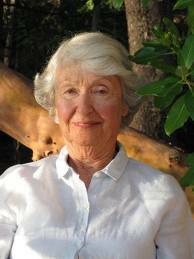 That is left to his long-time collaborator, and Canada’s premier landscape architect, Cornelia Hahn Oberlander. Cornelia Hahn was born in Germany and grew up in the U.S. After studying history, art and botany at Smith College, she went to the Harvard Graduate School of Design, where she studied architecture, planting and landscape design, graduating as a Bachelor of Landscape Architecture. Also at Harvard, Hahn met her Canadian architect/city planner husband, Peter Oberlander. In 1953, he accepted a professorship at UBC (where Erickson would later join him on staff). 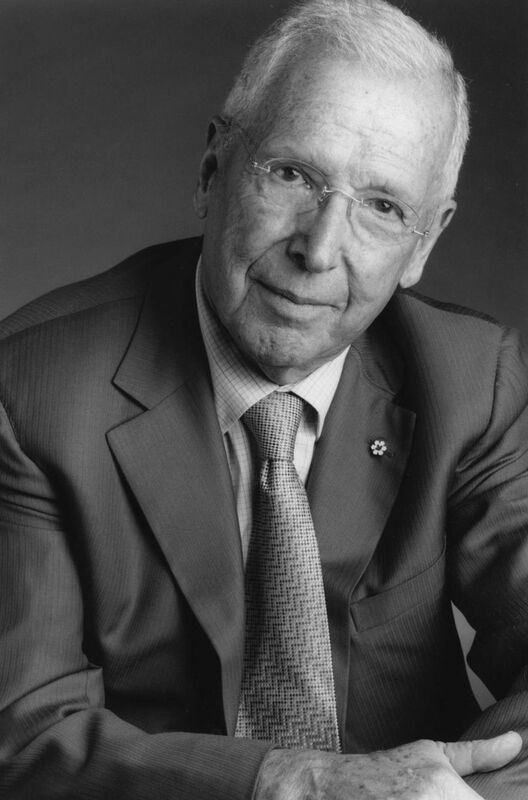 “When we first moved to Vancouver, I saw Canada as a new country with untouched spaces and limitless potential and challenges for my profession,” recalls Oberlander whose first projects were the grounds of the UBC Faculty Club and UBC’s Rose Garden. But she was also raising three children, and became interested in playgrounds. She designed the playground for the Children’s Creative Centre at the Canadian Federal Pavilion at Montreal’s EXPO ’67. She also became a member of the National Task Force on Children’s Play, and co-founded Vancouver’s Children’s Resource Centre. 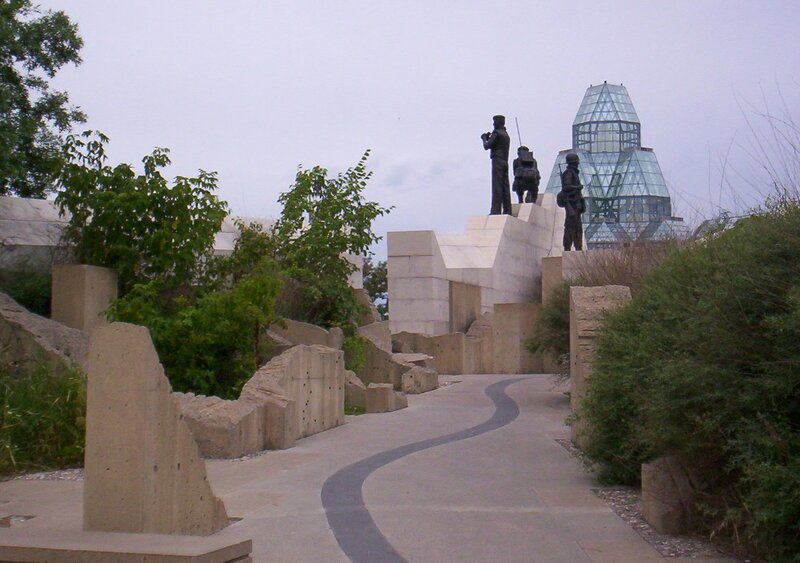 In addition, she is Past-President of the Canadian Society of Landscape Architects, and its former Environmental Chairman, and she remains a Fellow of both the American and Canadian Societies of Landscape Architects. Much of Oberlander’s work is well-known. For Vancouver’s Expo ’86, she was the landscape architect of Canada Place, the Pan-Pacific Hotel, the World Trade Centre and the Ontario Pavilion. She was awarded the Canadian Society of Landscape Architects’ National Award for her work on the Ottawa National Gallery, and she designed the grounds of the Environmental Science Building and the Ward Environmental Garden at Peterborough’s Trent University. 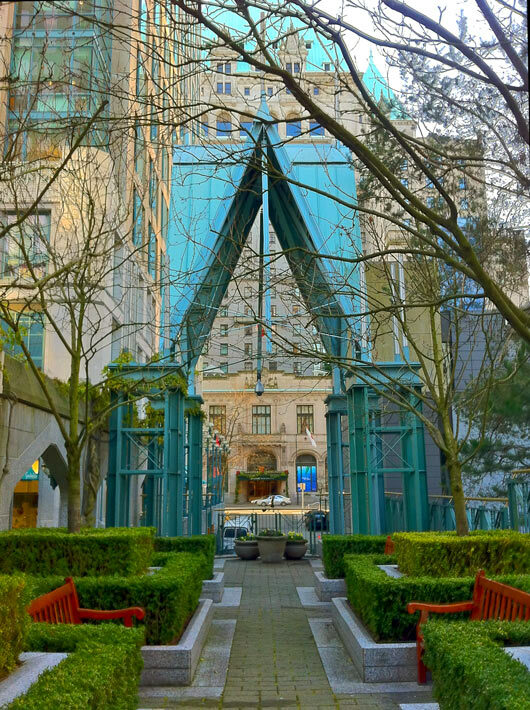 In Vancouver, the exquisite Cathedral Place Renaissance Garden is Oberlander’s, and she worked with Bing Thom on BC’s Chan Shun Performing Arts Centre, and with Matsuzaki Wright Architects on UBC’s Institute of Asian Research. Oberlander’s philosophy toward landscape design stems from her days at Harvard, where she enjoyed helping architects ensure that their buildings related to the landscape. To this day, her projects are always based on architects’ design concepts, but she infuses those with the result of her own studies of the social, cultural and physical features of each site. Her trademarks are simplicity of form, sculpted earthen mounds and a ‘less is more’ palette. Her gardens consist of solid areas of flowers in pink, blue, grey or white, with lots of grasses and shrubs. She uses her mounds to screen out traffic, to provide an element of surprise and for the burial of building scrap. And she never uses anything exotic. She does not do rockery, topiary or fountains, although she does use water to reflect the landscape. She prefers simplicity, makes sure that her landscapes require minimal maintenance and she has never exceeded a quote. Her approach is direct. She won’t take a job unless she is guaranteed supervision. She looks at the architect’s design, researches the site, quickly designs the landscape, then goes back to the architect and client and works with them to compose the palette before working out the grading and drainage. She takes time to educate the architect, contractors and maintenance people, and she stays on after each project’s completion to see that everything goes as planned. 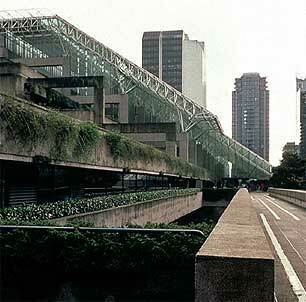 Oberlander first worked with Arthur Erickson in 1974, when she joined the landscaping team for his famed Robson Square. They have since done three dozen projects together. “It’s unusual for an architect and landscape architect to work so well together,” she says. “The relationship is often a struggle. Arthur and I have a very smooth relationship—we don’t even have to talk much. I know what he likes, I see his concept and I know what I have to do. “One of the wonderful things about working with Arthur is that be believes in considering the landscape when he’s devising the building’s concept. Many architects believe that you must finish the building before the landscape can be designed. Arthur and I compose landscapes together and agree that the outdoor space should be dramatic without being fancy. 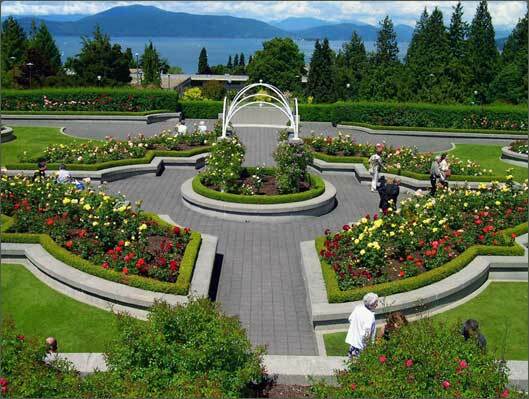 “For Robson Square, we worked out the garden before he did the drawings. Then we worked on the final drawings together, deciding on the grading and drainage—once the grading and drainage are right, the planting falls into place. 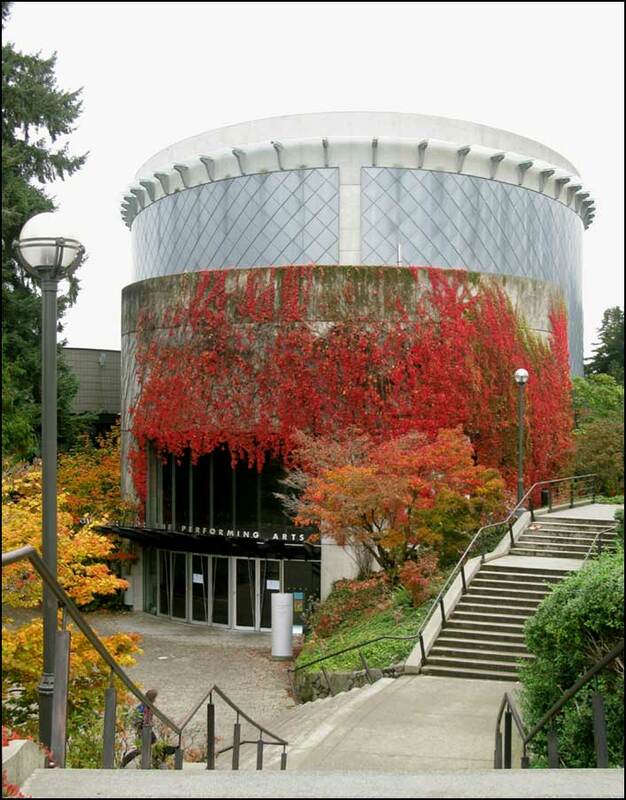 Another famous Erickson-Oberlander project is UBC’s Museum of Anthropology (recently featured in the film Intersection; Erickson was the model for Richard Gere’s architect). The purpose of the museum is to house Pacific Northwest Native artifacts, so Oberlander felt that its landscape should simulate that of the Queen Charlotte Islands, home of the Haida Nation. She showed Erickson pictures of this landscape, with the totem poles standing on mounds covered with wild grasses and surrounded by forest. With help from seed expert Angus Richardson, the concept was realized. Erickson’s concrete and glass building sits on a promontory facing the ocean and mountains. Rocks, shells and logs accent the landscape, which consists of meadows and mounds seeded with indigenous grasses and flowers—wild roses among Scotch Broom, Hemlock over tall wild grasses, purple, pink, yellow and white Vetches, ferns amid Oregon Grape—all of the plants used in the Haida lifestyle. A grey gravel pond reflects the mountains, and grassy mounds shield the museum from traffic and create a sense of hills rolling to the ocean, as they do in the Queen Charlottes. Erickson and Oberlander did not get their way in all design aspects of the museum. They wanted the site covered with all plants used by Pacific Northwest natives, to create an outdoor museum, but funding problems arose. Most frustratingly, Oberlander recalls, the university kept mowing the grass. “I said: ‘Native people didn’t have lawn movers, why are you cutting the grass?’”. 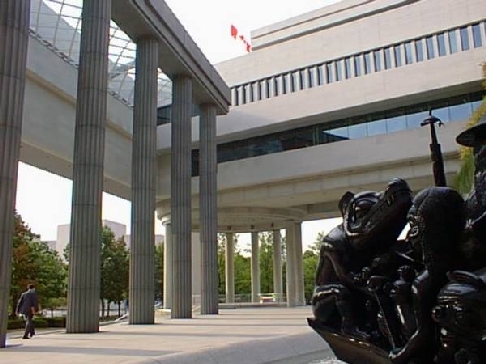 An even more famous Erickson-Oberlander project is the aforementioned Canadian embassy, which Oberlander calls one of the most exciting projects she’s working on. And for it, she was presented with the National Landscape Award for the Beautification of America. 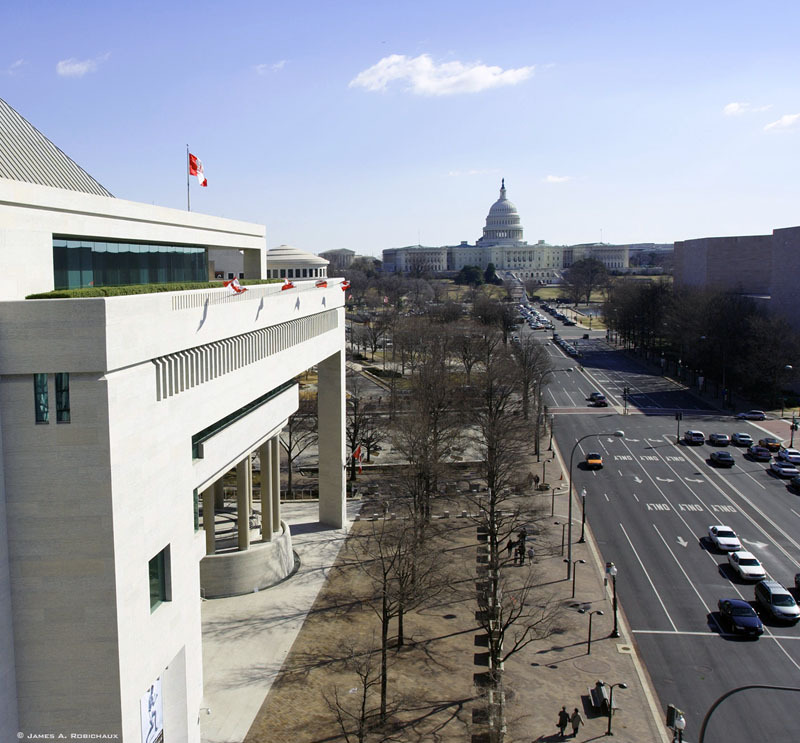 “The chancery is important as a Canadian presence in the heart of Washington, and I was able to work as I like to—from the beginning, as part of a team aiming to integrate the building and landscape. It was also a chance to show what landscaping will be like in the 21st century, when we’ll no longer have space around buildings for our designs. Erickson’s U-Shaped chancery takes up two thirds of the site and there is a pool in the paved courtyard. So Oberlander had to go up; her landscape is attached to each floor’s balconies with planter boxes, giving each office its own cascading garden of Memorial roses, Gumpo White Azalea, Delaware Valley White Azalea, and Cockspur Hawthorn. “Like cascading trees growing out of Canada’s rough mountain ledges,” she explains. 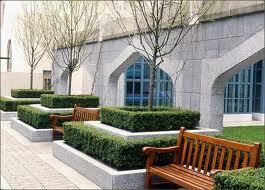 Other plants used for the chancery were Scarlet Oak, Red Oak, Eastern Red Cedar and Boxleaf Holly. To allow growth in the boxes, she created a support system of a light-weight growing medium, a low-water consumption irrigation system, slow-release non-toxic fertilizers and safety devices for maintenance workers. Oberlander has just completed work on Ottawa’s Peace-Keeping Monument and is now working on the new Ottawa City Hall, plus the landscape of the new Northwest Territories Legislative Assembly building in Yellowknife, which will be landscaped with plants that are genetically true to the region. Meanwhile, Erickson is designing a new cultural centre in Malaysia. So we don’t know when they’ll collaborate again. But we’ll be looking forward to it. All landscapers wish that architects were more understanding of the landscaper’s job. Well, one of Canada’s leading architects feels the same way. Bing Thom was born in Hong Kong and raised in Vancouver. His uncle was an engineer and when Thom was eight, he visited his uncle’s office. There, he saw architectural drawings and decided to make drawing such plans his life’s work. In 1966, Thom graduated from the University of British Columbia (UBC) with a degree in architecture. 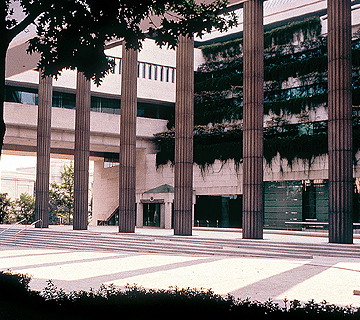 After obtaining his Master’s in Architecture from Berkeley, he spent two years teaching at the University of Singapore, then returned to Vancouver and taught at UBC for another two years. 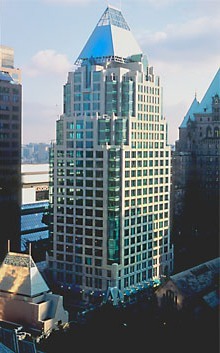 Thom helped Erickson on the now-famous Vancouver Courthouse/Robson Square. “This project involved a lot of landscaping,” remembers Thom. 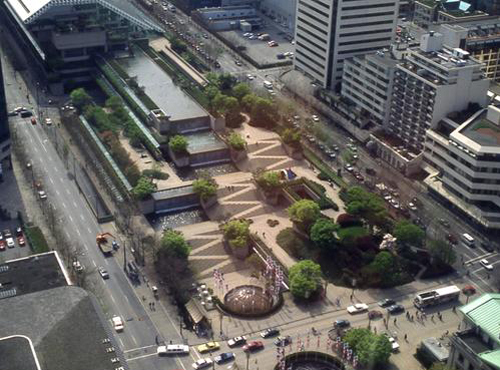 “Vancouverites wanted a park. The government wanted an office building. So we put the park on top of the office building. 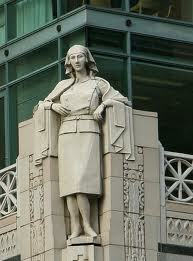 “The courthouse was interesting—three mid-downtown blocks and we were putting a garden atop a man-made structure. The main questions were of waterproofing and finding the right soil mix. So we developed a totally new soil that is both lightweight and able to sustain nutrients. 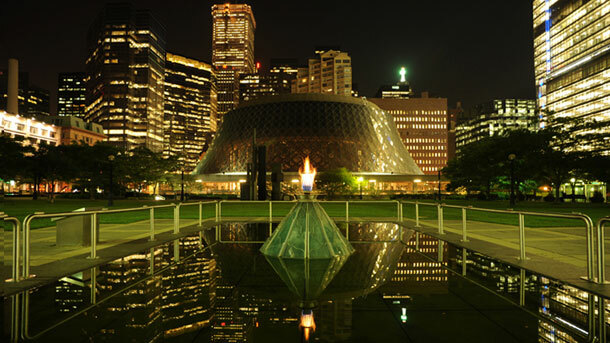 Thom next project was Toronto’s Roy Thomson Hall which he designed in a park setting. In 1980, he again helped Erickson, this time on Los Angeles’ Bunker Hill project, which involved re-developing five mid-town blocks and adding linear parks and green space. In 1982, Thom opened his own office and now employs a staff of 20, including nine architects and his wife, Bonnie. It is Bonnie, not Bing, who has the green thumb. The daughter of a farmer, Bonnie is an educated landscaper and works on all of Bing’s projects. “I have a feel for gardening, but Bonnie has the talent. I tell her how I want to project to look and she compiles a list of the plants that will get me that look, according to their colours and textures. Thom is an architect first, but he will not design a building unless he also designs the landscape. “It’s a personal thing. The building must grow from the ground, and the landscaping is the foundation. Each building must sit correctly on that setting, while relating to the landscape. So the landscape is actually more important than the building. Many architects don’t realize that landscaping is essential to architecture—that buildings and gardens are inter-related and indivisible. What do Thom’s clients think about his approach? This fits with a trend that Thom has seen increasing—and one that he thinks the landscape industry should be capitalizing on. “People are living closer together and are nostalgic for gardens. I see more rockeries, solariums, and balcony and roof gardens, and there’s a demand for hobby plants, like bonsai. People want more colour in plants that take up little space. Thom also advises the landscape industry to lobby for universities to include landscape architecture in their architecture and engineering programs. “Most architects can’t be bothered with the extra work of landscape architecture. The problem is that no landscape courses are required to get a degree in architecture. This should change. The architect finds himself working on a project where the client wants a park or garden, and winds up in a situation where the right hand doesn’t know what the left is doing. “Universities don’t require architects to take interior design courses either. That also makes no sense. It’s like medicine, where specialists come to think of the body in parts, rather than as a whole. “People wonder why I bother with the landscape but it’s perfectly logical. The building, the interior and the landscape are inseparable, and the same creativity has to be behind all three elements. This should be taught as part of any school’s architectural program. Thom, now 53, still lectures at UBC and has just completed a three-year term as Chairman of the Vancouver Public Library Committee. 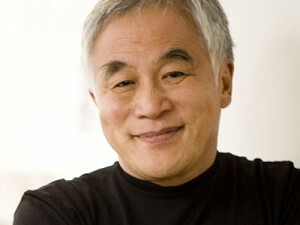 His most recent achievement, however, was his award-winning Canadian Pavilion at EXPO ’92 in Seville. For the first time, Thom had to use man-made materials. He created a jagged white front which looks like a snowdrift during the day but, when lit at night, looks like the Northern Lights. 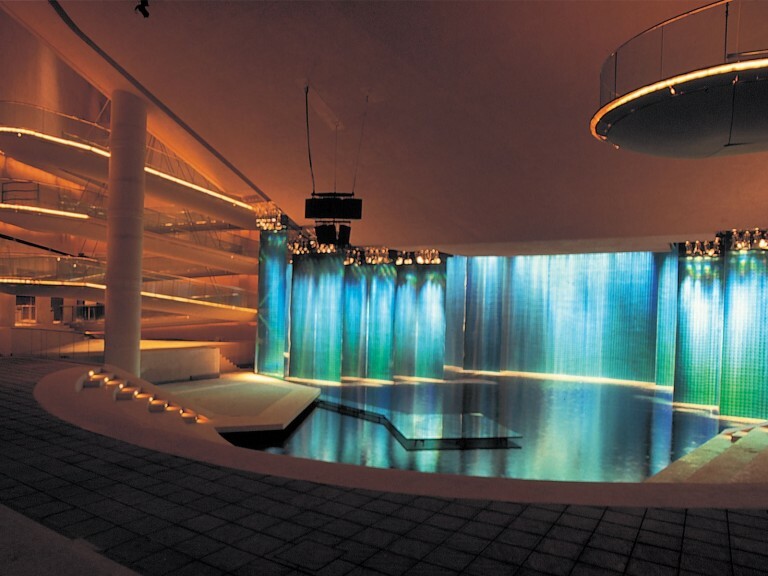 Inside, the pavilion’s focal point is a wall of shimmering blue/green water—it’s actually panels covered with etched aluminum foil. People were so enthralled by the effect, they waited up to 10 hours to get in a second time. British Columbians are spoiled. Most of us live with mountains, spend our days unavoidably looking at mountains. Mountains and lakes, mountains and rivers, mountains and mountains. We’re used to seeing wildlife, and a trip to Calgary is no big deal. But for people from Kansas City or Manhattan, Liverpool or Cairo, a trip through the Canadian Rockies is an awe-inspiring, once-in-a-lifetime experience. 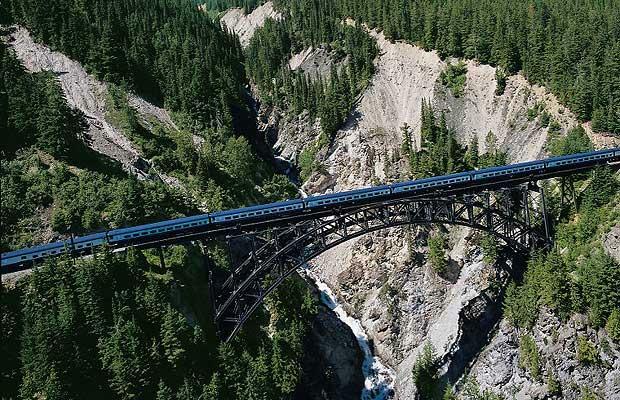 And this is why Rocky Mountaineer Railtours is one of the world’s most coveted of train trips. 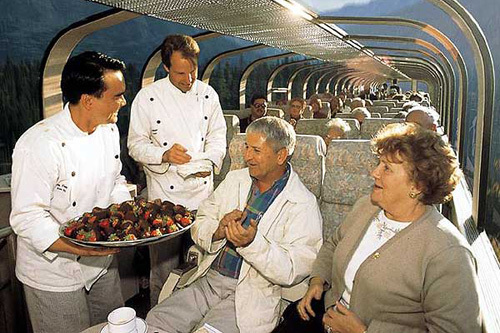 The Rocky Mountaineer story goes back to 1988, when VIA Rail, Canada’s national passenger train, started running a service called ‘Canadian Rockies by Daylight’. The service was heavily subsidized and, after two years without profit, the federal government put it up for auction. Twenty bids were received; the rights were awarded to Vancouver’s Great Canadian Railtour Company (GCRC), a team of former railroad executives led by one-time Gray Line Tours president Peter Armstrong. Rail is no longer a cheap, efficient way of transporting people over long distances, but the GCRC people knew that if the trip became an experience, it could be successfully marketed. They were right. This was long before terrorism hit the travel industry but, even then, North Americans were looking for different types of vacations, especially those that didn’t involve leaving the continent. And tourists from all points of the globe want experiences—not just a couple of weeks sitting on a beach. They want an understanding of the places they visit; to experience the culture, history and geography of unique places. 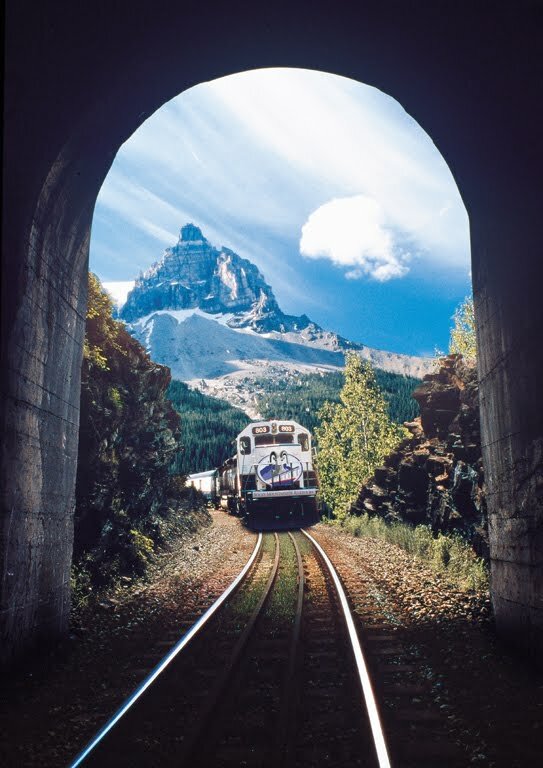 GCRC purchased the VIA routes and equipment, bought and refurbished the old VIA coaches and, in April 1990, began operating a 500-passenger train service between Vancouver and Jasper, and Vancouver and Banff/Calgary. By the following May, capacity had increased to 600 passengers and departures were up by 50%. GCRC employed 50 people and received 11,000 guests. 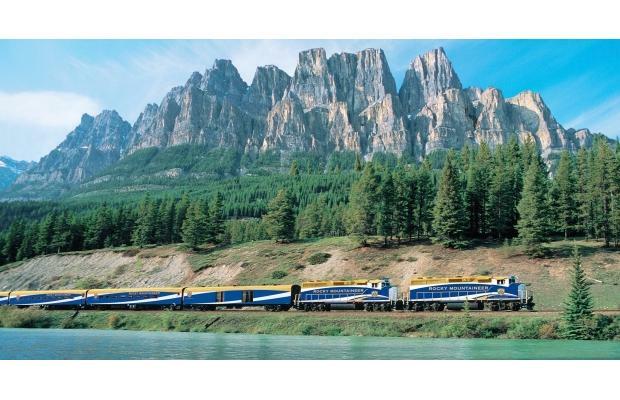 Today, Rocky Mountaineer Railtours (RMR) is the largest private passenger rail operator in North America. It employs 350 people, owns 65 pieces of rolling stock and, in 2001, welcomed 73,000 guests. And the whole success story boils down to terrific service, excellent guest relations and targeted marketing. 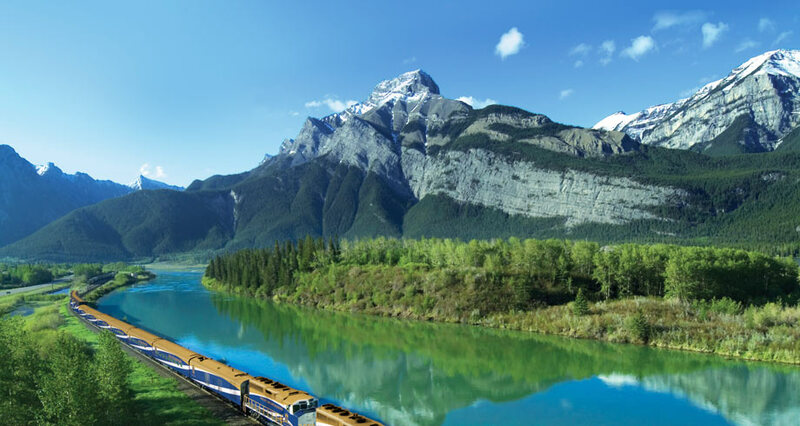 The Rocky Mountaineer experience is a two-day, all-daylight journey that follows the historic train route constructed over 100 years ago through BC and the Canadian Rockies. (The high season is April to October, but there are also winter tours.) It’s not just a trip from Vancouver to Calgary; from Calgary, guests can do the return trip, drive out of Calgary, fly out of Calgary, or keep heading east on VIA. If they return to Vancouver, they can hook up with a cruise to Alaska, head to Whistler, Seattle, home, whatever. There’s a Calgary Stampede Tour, a Christmas in Victoria tour, various wildlife tours, skiing tours—RMR markets 40 different packages. For the rail portion, guests choose from two levels of service: Gold Leaf, which is first class, and Red Leaf, which is first class-ish. Red Leaf is classic rail travel on 50 year-old reconditioned Pullman coaches. There are reclining seats, large picture windows, open-air vestibules and in-seat dining. Gold Leaf coaches are $3.5 million, state-of-the-art, two-tier cars with glass ceilings, observation platforms and dining rooms. Either way, guests are wined and dined with BC Salmon, Alberta beef and BC wines accompanied by white linen and fresh flowers. On-board attendants speak English, French, German, Japanese and Mandarin, and give passengers plenty of notice when the train is about to slow for key photo ops. 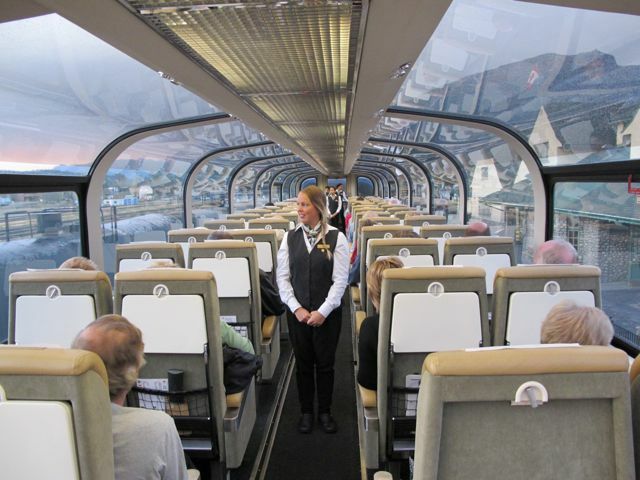 Guests carry detailed maps and follow the line’s history with the Rocky Mountaineer newspaper. 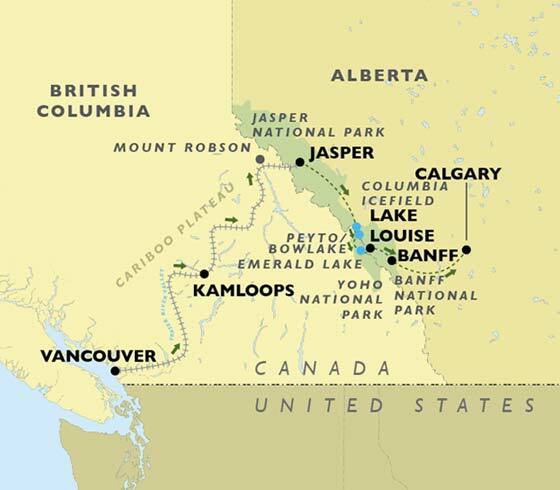 The two-day journey travels 918 miles through the UNESCO Rocky Mountain World Heritage Site, which is Mount Revelstoke National Park, Glacier National Park, Yoho National Park, then Banff and Jasper. The average pace is 75 k/hr and passengers do not disembark, but they can gape away at bears, bighorn sheep, moose, deer and elk. Along the way, they take in seven mountain ranges, plus tons of bridges, tunnels, waterfalls, canyons, lakes and rivers. And in the middle, they spend the night in Kamloops, where they have the option of attending the RMR-owned Two River Junction Dinner & Musical Review. The cost of the trip depends on passenger choices. The minimum is $499 for Red Leaf, $999 for Gold Leaf (the split of choice is 50/50). When people order and book directly from the RMR brochure, they can spend up to $6000 per person; the average is $1300. But if they want to rent a car and drive back from Calgary, or head back to Vancouver via limousine, then stay at the Four Seasons before spending a week at Whistler, it can all be booked as an RMR custom tour and the sky’s the limit. RMR houses a group travel department that arranges customized itineraries for groups—in the incentive and leisure travel sectors, plus the pre- and post-conference sector (many companies have their conferences right on the train). Outside North America, RMR has sales reps in 18 countries, plus five sales managers who work out of the Vancouver office but travel the world making sure that tour operators, travel wholesalers and travel agencies are aware of the company’s offerings. The company supports the European market through a London office, PR firms are active in Los Angeles and London, and the company works very hard at maintaining a positive relationship with the international media. This coverage not only helps sales, but it has helped the company build an excellent reputation. Its trade-marked slogan ‘The Most Spectacular Train Trip in the World’ was actually a comment made by former Canadian Prime Minister Joe Clark. Rocky Mountaineer is only one of seven rail journeys to twice make the 20 Best Rail Experiences list issued by the prestigious International Railway Traveler magazine. In 1998, it was voted Best Attraction by the North American Association of Travel Writers. Fodor’s listed RMR’s winter tours on its list of Top-Ten Most Overlooked & Under-Rated Winter Tours. This sort of thing goes over very well with the RMR market, which is people 55+, mostly couples and empty-nesters who can afford to be discriminating. About 40% come from the US; 25% from Britain, 20% from other parts of Canada, the rest from Europe, Asia and Australia. There are two groups of customers: tour operators and FITs, or Fully Independent Travelers, who either call to book directly, or ask their travel agents to book. The Internet is a big part of the marketing effort. 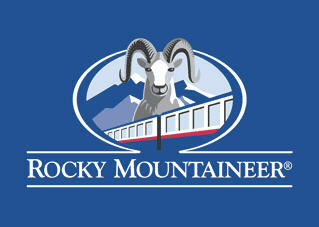 RMR has three sites: rockymountaineer.com, which has been up for four years; winterrailtours.com and spectacularmeetings.com have been up for two years. Gilley notes that rockymountaineer.com receives 2,500 unique visits every day, making it one of the most visited of Canadian travel sites. The sites are extremely thorough, offering detailed information packages, streamed video and 360-degree Ipix tours, plus scheduling and pricing information. But you can’t book on-line. You have to call. When someone has chosen his trip from the website, he calls the 800 number; in Vancouver, there there’s a 24/7, 24-operator call centre that fields 1000 calls a day. The call is answered by a well-trained RMR salesperson, who starts with the caller’s immediate choice, then helps with the ‘vacation design’, then books it all. RMR has strategic alliances with Hertz, Laidlaw Motor Coaches and Fairmont Hotels, so the up-sell angle is very important. But it’s a win-win situation. With one phone call, RMR makes a profit, the consumer gets a fabulous, custom-designed vacation. And the one-stop-shop approach makes life easier, and costs lower, for travel agents. There’s another, equally important kind of caller. Those are people who want the all-important, 56-page RMR brochure, 800,000 of which are distributed every year. The brochure is an even more important planning tool than the Internet information and is most likely to lead to the booking. Gilley’s print advertising budget is around $850,000. Aside from bringing in those phone calls, the advertising provides very strong brand awareness. The ads tell people to call their travel agents, or the 800 number. This helps to drive business to the travel agents, who are also very important to RMR’s success. “We support travel agents very strongly,” says Gilley. “It’s important that people deal with travel specialists. We’re happy to take bookings over the phone, but we don’t want to cut off the travel companies—about 60% of our business comes from travel agents. 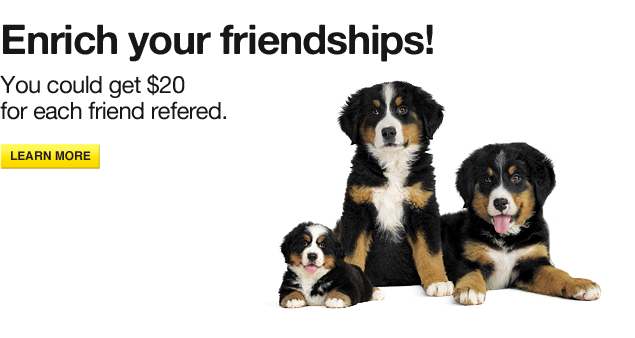 And unlike other travel-industry companies, we have not cut or capped commission rates. “This business is similar to any manufacturing business. We design and manufacture the product. We sell it to the wholesaler, who sells to the retailer, who sells to the consumer. And then we have to secure distribution to get our product on the shelf. We have to build relationships, maintain them, and build new ones. Gilley joined RMR in 1997. At that time, the company’s marketing was very much grass-roots. There was no database, no print advertising. And the marketing budget was only 2%.Well, now the marketing budget is only 4%. RMR has come a long way, however. Its marketing strategy was set up in four stages, with each stage taking one year to implement and all four eventually running concurrently. The four stages are Response, Anticipation, Experience and Referral. Gilley explains: “Response involved retaining an advertising agency [Vancouver’s Bryant Fulton & Shee], then ensuring that our brand was in place, and that our ads were ready to go, so we had a way of generating response from potential guests. And we provided our PR people with the messages required to generate exposure for the brand. “Phase two was Anticipation. The best part of any trip is the anticipation of it—the ability to say ‘I’m going on this vacation and this is what I’m going to do’. If we wanted people to say ‘I’m going on an incredible rail tour in an awesome part of the world’, we needed to capture those elements in our materials. So we re-did our letterhead, our corporate identity, our brochures, vouchers, itineraries, travel guides—everything down to the travel wallets. We built a presence in the hotels and started to get into response marketing. “The Experience component begins when you arrive at the train station to board. We created a product department which is a group of people dedicated to designing itineraries and improving the on-board experience. We own 28 motor coaches, so we branded those and changed the colour of our trains—to red, white, blue and gold. And we looked at all our souvenirs, to make sure that there was consistent branding and delivery throughout. RMR also sells full-length souvenir videos for $18.95. Gilley wouldn’t give any precise figures relating to profits, but did note that annual souvenir sales are well over $1 million. In 1999, RMR started conducting direct response campaigns, all of which have been very successful. Last fall, it spent $37,000 on mailing a win-a-trip package to 20,000 people who had previously requested brochures. The result was 203 bookings, 511 guests and $1 million in sales. Another campaign was simply a questionnaire sent to 20,000 US households; it received 13% response. The company does some market research, though not much. Focus groups are the communication check for creative and there has been telephone research. But the best research is done on the trains. Four hours before the end of each trip, guests are given reply cards. They have the time and the motivation to fill them out, and about 32,000 cards are received each year. The cards are checked every two weeks; if adjustments are indicated, they are immediately made. “This is the best way to know how we’re doing,” continues Gilley. “But it also allows us to build relationships with our customers. We employ three people who do nothing but look after responses to guest comments. If someone says his coffee was cold, we send him a letter. If someone says that he wanted to buy a sweatshirt and they were all gone, we’ll send him a letter. If there’s something a little more serious, we’ll send an appropriate refund. We send out 10,000 personal letters annually in response to comments. For natives of Germany, a country where open land and big sky are at a premium, western Canada is the Land of Opportunity. In the early ‘80s, pub owner Jakob Tobler, and real estate developer Buko von Krosigk immigrated to Canada and settled in BC’s Okanagan Valley, specifically Vernon. Their goal was to address one glaring problem with their new home: the beer was no good. The offerings of Canada’s major breweries fell short of the quality to which they were accustomed. Meanwhile, Jakob’s son Stefan had earned a degree in beer-making at a German university, and that made him one of only two certified brew-masters in western Canada. It was logical to establish a brewery and sell true German beer—but just within the valley, they thought. 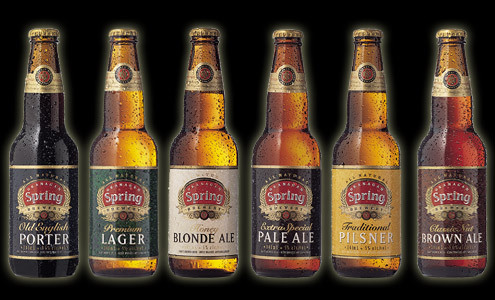 The partners bought a 10,000 square-foot fruit-packing house, invested in the finest equipment available, put the neighbourhood name together with that of a brewery that had operated in Vernon in the 1800s (the Vernon Spring Brewery), and Okanagan Spring Brewery was born. There are three types of breweries. A ‘microbrewery’ produces less than 15,000 hectolitres per year (a hectolitre is 1000 litres). 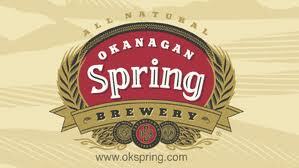 Okanagan Spring Brewery (OSB) is an example of a ‘regional brewery’. Then there are the mainstream, or commercial, breweries such as Labatt and Molson. OSB brings barley from the Canadian prairies and has it malted in the Okanagan. Hops are imported from Germany (the hop is a plant and there are two types: aromatic and bitter). The X Factor is the yeast, which is prepared to OSB’s secret recipe by an outside supplier. The already high-quality Okanagan water is purified, and that’s it. There are two processes which craft breweries do not use. In ‘high-gravity brewing’, water is added back to a sort of beer concentrate. 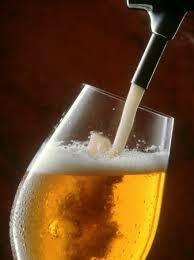 It’s more efficient, and more profitable, but it makes beer taste diluted (as in American beer). 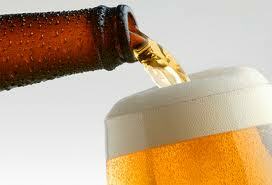 The other process is pasteurization, which is when beer is heated or boiled to kill germs. Pasteurization extends shelf life, but it makes for common ‘Wonder Bread’ beer. In craft brewing, everything is ‘sterile-brewed’, so pasteurization isn’t necessary, although the shelf life of craft beer is reduced to about three months. After that, the beer is still drinkable, but may have the ‘skunky’ smell that German imports often acquire by the time they reach us. It should be noted, however, that it is a misconception that a small brewery produces a higher-quality product. The opposite is true. A regional or mainstream brewery has employees devoted to quality control. And if a batch falls short of its standards, it’s thrown out. A microbrewery can’t afford to toss imperfect inventory. While there are many beer brands, beer (‘baere’ is German for ‘barley’) is broken down into two categories: lager and ale. The beer-drinking population is split in half—half prefers lager, half ale. The English are the ale masters; Germans are best known for lager. So Buko and Jakob started with lager. 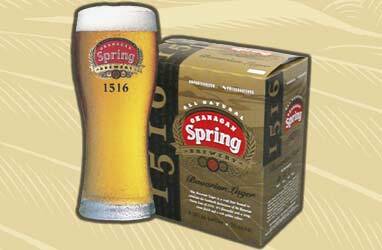 On December 31, 1985, the first pint of Okanagan Spring Premium Lager was poured. While Jakob and Stefan managed operations, Buko started traveling through the Okanagan Valley, selling draft beer to pubs and restaurants. Sales took off and, after a little lobbying, he was able to get the lager onto liquor store shelves. Then Expo ’86 came up and the BC government extended sales licenses to smaller provincial beverage manufacturers. Demand surged. Buko moved to Vancouver and started selling on the Lower Mainland and Vancouver Island. Today, Okanagan Spring Brewery is BC’s #1 craft brewery. Once customers had tried OSB lager, they asked for porter. Stefan responded by creating Okanagan Spring Old English Porter, which quickly earned a loyal following. Also in response to demand, in 1988, Stefan created Extra Special Pale Ale. Now it’s winning gold medals at international beer competitions and is the most successful craft-brewed brand in BC. Breweries are secretive—they don’t discuss sales or profits. We know that British Columbians buy 25 million cases of beer annually, and that that translates to $425 million. The government takes 60% of that in taxes. A 12-pack of an OSB product is $17.45. Pelkey estimates that the industry average profit on a 12-pack is $1.70. He will also say that, in 1986, OSB sold 3,700 hectolitres, or 20,000 cases. In 1990, it was 25,000 hectolitres and, in 1995, 75,000. In its first years, Jakob and Buko put all OSB profits back into the company. In 1988, the brewery was revamped to increase production. A few sales people were hired. The brewery was expanded to 50,000 square feet. The focus remained on the three brands, while production increased and the company grew (it now has 150 employees, including a sales force of five retail reps and 11 licensee reps). The trade continued to ask for products. In 1995, to meet demand for an easy-to-drink dark ale, OSB released Cottage Nut Brown Ale. In 1997, in response to the success of the ‘honey’ category, which is lighter and more thirst-quenching, Honey Blonde Ale was launched. (There’s a direct correlation between colour, bitterness, weight and low sales, with lighter beers garnering higher sales.) In 1999, after market research showed that there was room for a different style of lager, there came Traditional Pilsner, modeled after the classic Czech Pilsen recipe. There has been just one failure—Autumn Red Ale. Not surprisingly, after years of increased success, a suitor came calling in the form of Ontario’s Sleeman Brewing & Malting Company. Although you’ll find no mention of it on either company’s website, Sleeman now owns OSB. Buko has retired; Jakob’s two sons still work at the brewery. With that change came a marketing person—Pelkey was hired in 1997. 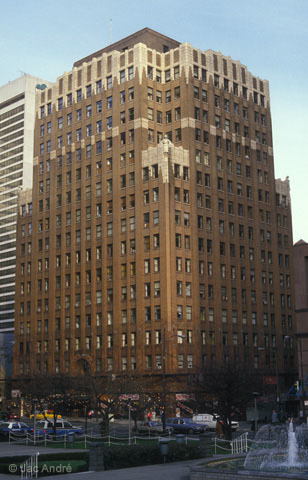 The first thing he did was conduct an agency review and appoint Grey Advertising (Vancouver) as OSB’s Agency of Record. Ipsos-Reid handles market research; point-of-sale and packaging is managed by dossiercreative. Last year, OSB’s packaging was up-graded, to the tune of $1.5 million, but it’s still notable for its conservative look. Just as the product names are plain and direct, there is a distinctly elegant tone to the packaging. You won’t find any zany graphics or wild colours—its labels are metallic, but that’s it for flash. The same is true for all OSB point-of-sale materials, which is just as well, given Liquor Control Board restrictions. There are three sales channels for a BC brewery: trade (pubs, bars, restaurants), consumer-direct through LRS (Liquor Retailer Sales; the pub-attached cold beer and wine stores), and the LDB (the government’s Liquor Distribution Branch). A brewery cannot conduct any marketing programs in the LRS trade channel unless the programs have been approved in the LDB channel. At the moment, in-store draws, contests or promotions are verboten. Danglers and shelf-talkers have to fit within strict size restrictions, and the largest allowed size was just reduced to 18” x 24”. OSB reps conduct hundreds of trade promotions every year—mostly instant gratification things like getting to keep your mug. All other promotions have to be in-case. With in-case promotions, you open your case of beer and find a card offering a chance to win ski passes, a fishing trip, golfing trip etc. 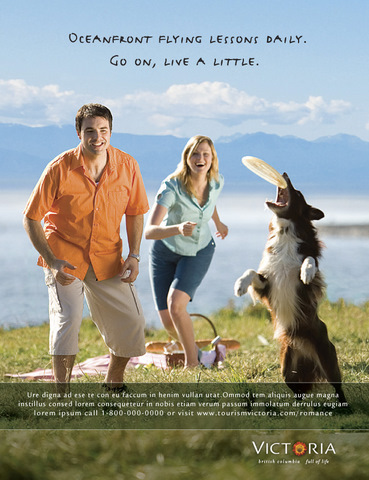 OSB consumers are off-the-couch types, so promotions are related to outdoor activities. OSB works with Golf BC and its courses, with the Oak Bay Marine Group and its fishing resorts, and with ski resorts and tour groups. But LDB regulations make for amusing situations. A brewery isn’t allowed to connect any physical activity with beer consumption. So in a recent white-water rafting promotion, the brewery was allowed to show the river, but not a raft, or anyone in a raft. There’s another wrinkle with the LDB that may surprise some. Since all LDB stores are government stores, you would think that, once an alcohol producer has a license to sell its products in BC, its products would automatically go onto liquor store shelves. ‘Not so. When a new product is launched, it has to be approved by the LDB’s Listing Policy Committee. After that, there’s still no guaranteed distribution. Every liquor store in the province has to be sold individually. OSB’s reps have to sell and service each government liquor store manager, just as if he were a hotelier or restaurateur. And there’s hot competition for that shelf and floor space. Fortunately, there is ‘beer category management’, which is the same sort of process used by grocery retailers. Liquor stores put premium products in the best locations, mainstream products in the intermediate locations, value products at the back. And what accounts for high-volume sales? A combination of reputation and marketing. Compared to other craft breweries, OSB conducts a lot of focus-group research. There’s an annual tracking study to gauge what’s going on in the beer industry and new advertising is tested. Pelkey says there’s a lot of emphasis on brand perception. 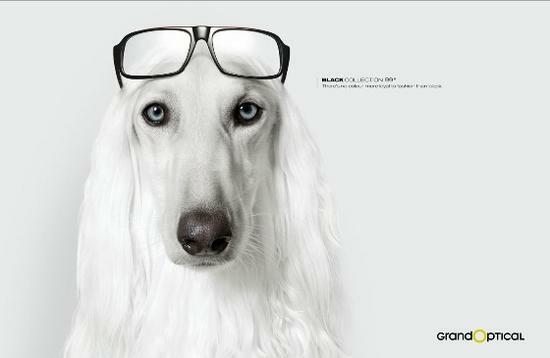 Grey Advertising doesn’t have a huge annual budget to work with—about $700,000. But it has used that money effectively. Most of OSB’s advertising spend is in radio, with print ads running in the summer months (there was some outdoor last year). Although some specific ads are produced for OSB’s two biggest brands—pale ale and lager, the budget doesn’t allow for each beer to be advertised separately, so the focus is always on the core brand attributes. “We never walk away from the core values of the brand,” says Grey Creative Director Jeff Lewis. “We keep the message consistent. Okanagan Spring Beer is from the Okanagan—a region known for its purity. It’s all-natural, premium beer. More than anything else, when it comes to branding beer, consistency is key. Plus, what we say is true. And that’s one of the big reasons why OSB is so solid. When a consumer pops open a bottle, the quality is there. There’s a lot of crappy beer on the market, but consumers now know that. They’re no longer impressed by image. Lewis notes that the OSB strategy has lately become a little more fun. One recent ad (which received angry calls from ex-Torontonians) was ‘Still Not Available in Toronto’, which pointed out that Toronto enjoys black flies and one tower, while BC has towering mountains and bald eagles. 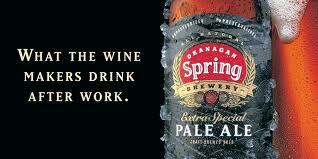 Another ad noted that OSB beer is what Okanagan wine-makers drink after work. 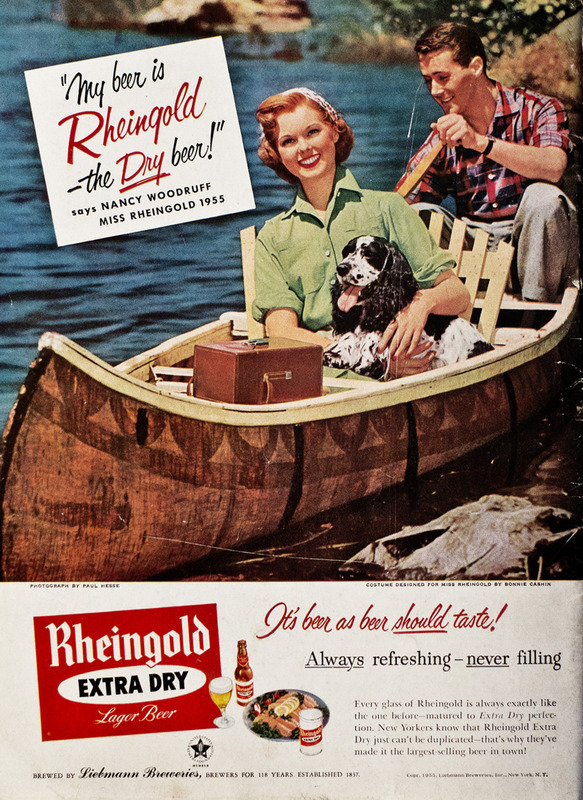 Lewis used the term for the Bavarian Purity Law—Reinheitsgebot, as an attention-getter in print ads. In radio ads, it is admitted that OSB does, in fact, use a preservative—the cap. “It is not easy to advertise beer,” continues Lewis. “You have to do work that cuts through all the other beer ads. For a brand with a more conservative stance, the ads with attitude accomplished that.